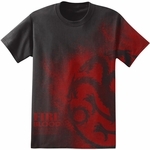 Here you'll find a wide assortment of dragon t-shirts! From fearsome beasts to majestic drakes soaring peacefully, any dragon lover is sure to see something they like. Never leave home without a dragon companion again with these wearable pieces of art!